If you’re a chronic thrift store shopper reading this right now, I’m sure you can relate to the overwhelming feelings of owning too many possessions. As much as you love to thrift store shop and collect thrifty treasures and style steals, each time you visit the thrift store you know that as soon as you return home, you must face the daunting task of figuring out just where to put it all! That’s why knowing how to declutter your possessions comes with the territory of knowing how to thrift store shop. Sometimes you just need to donate, give away or even trash some of your unwanted, unworn or unsalvageable belongings. Letting go isn’t always easy, so to help you know how and when to declutter your thrift store finds I’m sharing the seven questions I ask myself when deciding whether to toss or keep a thrifted garment. Keep reading after the jump for those tips and to learn how every question answered “no” means “yes” toward giving up the garment! 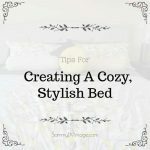 I was inspired to write this post because I am one of messiest people I know — just ask my roommate! I regularly practice declutter detoxification of my belongings so that I learn to value what I already own and remember to only buy what I truly need, and not just what I want. 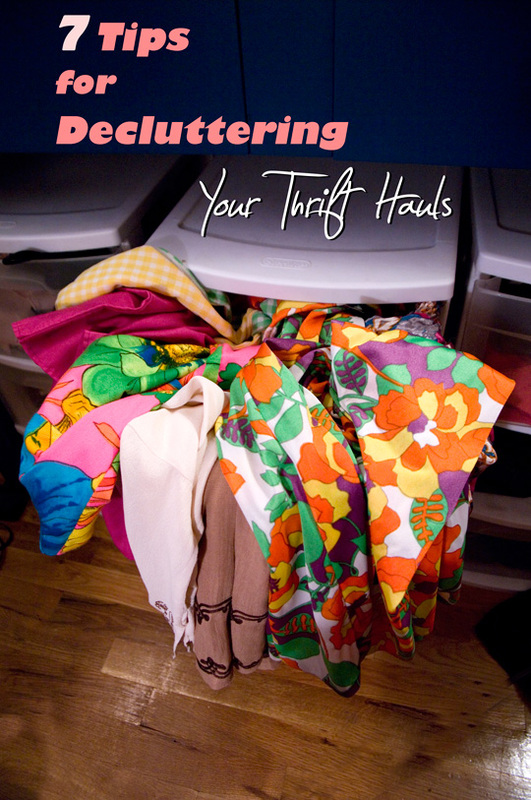 How do you declutter as a thrifter? Let me know your strategy for organization sanity in the comments below the post, or by saying hello on Twitter, Facebook or Instagram! ASK YOURSELF … does this garment fit me right this very second? DITCH OR DONATE BECAUSE … if the garment doesn’t fit, then why are you holding onto it? No matter how great of a thrift score it is, if the piece is never going to fit then you’re never going to wear it! MY STORY: The photo above shows me struggling to zip a 1950s lace dress that was part of my most recent thrift haul, where I purchased an insanely cheap vintage clothing loot at a costume shop sale in my hometown. Despite being such a gorgeous piece, there’s no reason for me to keep this dress with the hope that I’ll “someday fit!” My body is healthy as is, and I’d much rather it be worn the right way by the body that fits it best. WHAT TO DO: Donate it back to the thrift store or skip to question #6, “Will someone else appreciate this piece?” for more ideas. ASK YOURSELF … is this [missing button, tear, ripped seam, hem shortening, etc.] something I’m ever going to get around to fixing? DITCH OR DONATE BECAUSE … Chances are you’re prioritizing other things in your life over tending to those garments in need of some TLC. 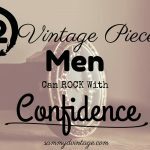 If you resist the thought of sitting down and actually using a sewing machine, then save yourself the pressure and move on! 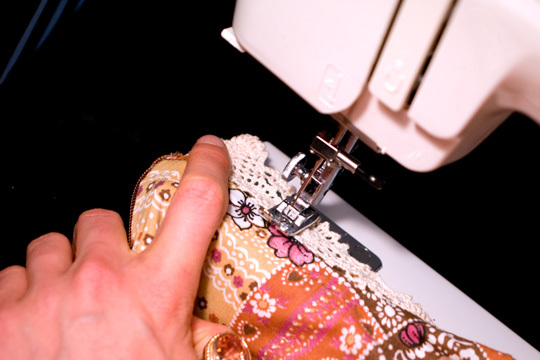 MY STORY: I have my own bag of “needs mending” items under my bed that’s full of torn seams and maxis I’d love to hem into minis. While I own a sewing machine (the picture above is evidence enough) I admittedly don’t make time to sit and actually use it. Actually, I forget how to even attach the bobbin! WHAT TO DO: Pay a tailor to fix your favorite pieces (I just coughed up $15 to replace two zippers on ’60s garments – totally worth it!) or consider those pieces new rags for cleaning after you’ve finished decluttering! 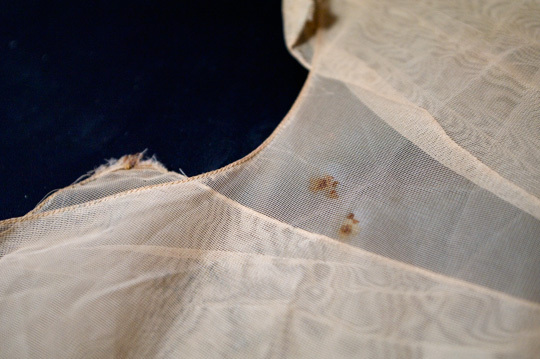 ASK YOURSELF … are these garment’s stains removable? 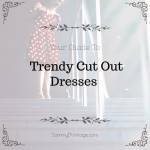 DITCH OR DONATE BECAUSE … even if the dress is a couture lookalike, if the style has permanent stains chances are you’re never going to wear it in public. The only exception are sentimental pieces, such as your grandmother’s dress that despite the stains, you want to hold onto as a family heirloom. MY STORY: I own quite a few stained vintage pieces from the 1920s through 1960s (and one amazing Edwardian era jacket!) that are currently locked away in storage bins. I bought them not to wear, but because I wanted to “collect” them. WHAT DO DO: Donate, trash or if a particularly gorgeous piece with unfortunate stains, transform it into a display piece for your home. ASK YOURSELF … was this DIY experiment successful? DITCH OR DONATE BECAUSE … if you’ve got a DIY experiment explosion on your hands, chances are you’ve butchered it into an unwearable garment. You chose to hold onto it “just in case” you got around to fixing it, but like any of the items in your needs-mending bag, the odds that you’re going to sit down and actually fix it are slim. 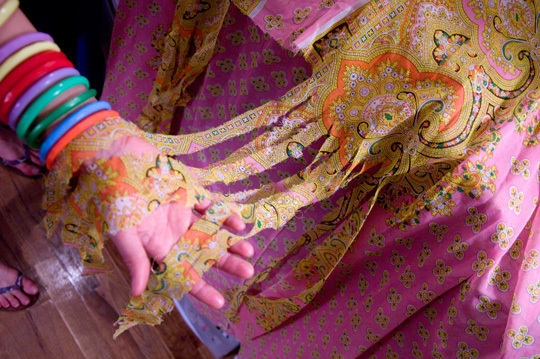 MY STORY: I’m the queen of DIY disasters, like this gorgeous 1970s caftan shown above that I chose to cut along the bottom hem for a “fringe” effect. 20 snips later and my vision of funky fringe never manifested itself. Rather, I was left with a dress that looked like it’d been through the shredder. WHAT TO DO: Toss it in the trash! I still have the cut-up caftan because my conscience tells me, “You just might need this for a future photoshoot!” but my gut tells me that the only photography ever worth taking of the piece is that which just happened for this post! ASK YOURSELF … is this a piece that I still even like and want to wear? DITCH OR DONATE BECAUSE … if your feelings about the piece are lukewarm, it’s something that you’re never going to get around to wearing because you won’t feel 100 percent comfortable dressed in something you’re not crazy about in the first place. MY STORY: I had lukewarm feelings toward these red-soled zebra print heels when I first bought them. Pulling them out to photograph for this post, I still have those feelings … and now I honestly just want to get rid of them altogether! WHAT TO DO: Donate it straight back to the thrift store because if you don’t like the piece, then it’ll be difficult to give away with authentic excitement (question #6). You can rest easy knowing that a future thrifter will find your piece and fall in love with feelings greater than just lukewarm! ASK YOURSELF … is this something I love so much that I could never give it up? DITCH OR DONATE BECAUSE … when you need a reason to declutter, the best motivation to have is that of choosing pieces to give up and give away as thrift gifts! MY STORY: My weekly thrifting trips can amass pretty quickly into bedroom clutter, which is why for every new piece I bring into my wardrobe I try to give one away as a thrift gift. WHAT TO DO: When possible, regularly send the garments you no longer wear or which no longer fit as thrift gifts to family members, friends and fellow vintage and thrift lovers to stay clutter free and be reminded that the best gift of all is that of giving itself. ASK YOURSELF … is this something I can wear for the everyday? 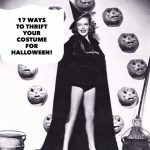 DITCH OR DONATE BECAUSE … playing dress-up comes but a few times a year, so detoxing your costume wear to fit with the major holidays (Halloween, Christmas and St. Patty’s Day are the most theatrical in style celebration) will help care for your closet’s clutter, too. 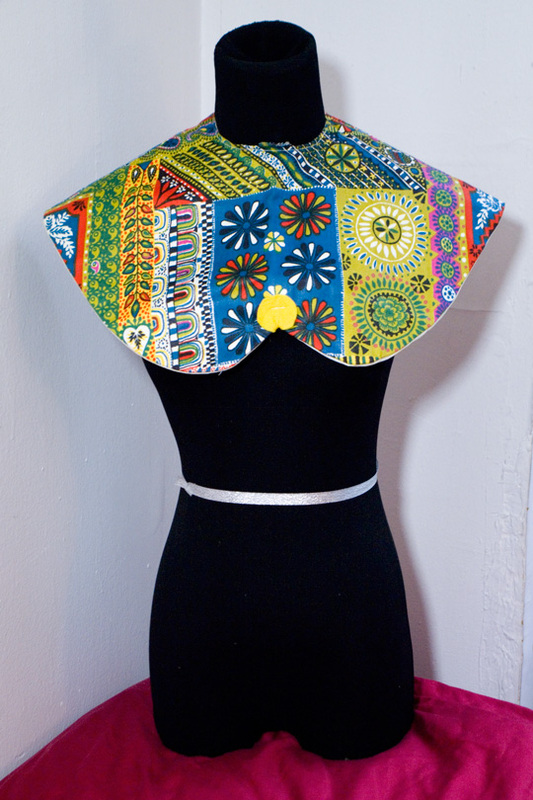 MY STORY: This patchwork pattern bib collar shown above found its way into my wardrobe but I’ve yet to determine how to appropriately wear it. Sure, I could throw it on over a T-shirt and jeans and call it a day, but where’s the dress-up fun in that? WHAT TO DO: Garments with theatrical characteristics can be well used by local high school theater groups or just a group of children who love using their imaginations to play dress-up. Since this bib is such a unique one-off garment, I’d like to give it to a young girl who I know will imagine it into a piece worn by a fairy tale princess or better yet, a THRIFT QUEEN! 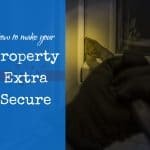 Such great tips, as usual!! And very timely too. The dress in the first photo is amazing! I would sell it on consignment or online. I cringe a bit at the idea of throwing vintage clothing in the garbage… could your caftan be rescued by hemming it just above the torn part? That is a good point, Kim! Ugh it’s just not a wearable piece because I REALLY shredded it. I guess it depends on how much of a DIY disaster it was. I think honestly she would make a good table cloth? I think Kim may have a point. Why not hem the caftan above the torn part and make it into a crop top? You could always add long 12″ long fringe. As far as the caftan goes can you take it to a tailor and have it reconfigured into a caftan blouse with a short full skirt using what’s left of the bottom part. The shredded part could be used to crochet a little rug or something. My focus lately, besides vintage clothing, has been depression era living tips and tricks. That has been the primary focus of my blog. It’s amazing how wasteful I have discovered that we are in this society. 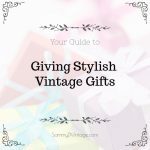 I love that you are sharing your vintage finds either by donating them or gifting them. You are indeed a true treasure! What’s your blog? I want to check it out. I love the idea of saving my “needs mending” pieces! Oh my gosh please connect with Jayme — she is genius! Awesome, thanks. I’m checking it out and you’ve got an awesome blog! I just checked out Jayme’s site too. I am so impressed! I need to do more with less! Awesome post Sammy. I’m totally the same way – soooo messy. But I’ve always said there’s a difference between messy and dirty and messy isn’t so bad! My room is currently undergoing rearranging and when getting all my clothes together in one pile I just about had a heart attack. Going to try to cut it in half and keep only the stuff I actually wear! How crazy is it that so many of us keep things we NEVER wear!? Megan did you de-clutter and cut in half yet? keep me posted! Great post! 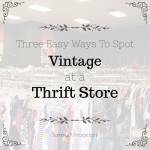 Totally for me I’m always trying to part with the old to make room for thrifted finds. It really can get pretty overwhelming to come home with a haul and have it sit there! I just unloaded a bag myself, Jenn and I had FORGOTTEN WHAT I BOUGHT! ahhhhhh!!!! lol! Hi Sammy! 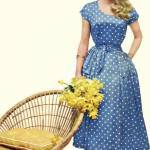 We love your vintage fashion tips, and would love to feature on the site CraftFoxes. Was wondering if we could reprint one of your photos (https://sammydvintage.com/wp-content/uploads/2012/06/IMGP1993_540.jpg), give you credit, and link back to your blog post. Let me know! Thanks for sharing your thoughts on kaftan wedding dress.